I think it's helpful to focus on shoes on Black Friday (and other big sale holidays) because many of my favorite shoe brands don't have sales as frequently as the big clothing chains and department stores; Black Friday really is a "special occasion" for many of these brands. The four brands below have some beautiful work options, and I think it will be worth your time to spend exploring their websites over the long weekend. I'll warn you, I consider most of these brands to make "investment" pieces, so they still won't be cheap, even with the discounts, but the quality and beautiful styling makes them worth the extra expense. M. Gemi: M. Gemi shoes are hand made in Italy, but the brand sells directly to consumers and therefore doesn't have insane luxury markups to begin with. Given this, they rarely run sales, but are offering $50 off every pair in stores and online from November 24th through November 27th. I love the emerald green Lustro pump and the wine Lustrare boot shown above (either would look beautiful paired with the wine hues that are so popular right now), and the black leather Estato is a beautiful version of the classic black stiletto that you MUST have in your corporate closet! Each of these shoes comes in several beautiful colors, so definitely take a look if none of the ones I've pick pique your interest. Dear Frances: Dear Frances is famous for its Spirit Booties (pictured here in the beautifully feminine Fawn color), but I also love the classic Elle Knee Boots. Olive is a beautiful alternative to the standard autumn neutrals (it looks drop dead gorgeous with black and camel), and I would love to add this super chic pair to my collection. The brand is offering 25% off on everything from November 24th through November 27th with code BLACKFRIDAY25. The boots are still pricey, but the disount brings them into the realm of rationality. Sam Edelman: I love Sam Edelman shoes and think they are a great value for the quality even at full price. Tack on the 30% discount that they are running from now through November 26th with code SAMSGIVING, and you've REALLY got a deal! Take this opportunity either to stock up on workplace staples (the tan Hazel heel is one of my all-time favorites), or to go a little wild with a fun color or print, like these red Tristan pumps or these leopard Hazel heels. Or go all-in on the velvet trend with these Case ankle booties (which are really more of an after-hours shoe, but I just love the lush velvet and sea blue color)! At these prices, if the shoes are only "in" for one or two seasons, or you don't get to wear them all the time, your price per wear is still quite low. Cole Haan: So Cole Haan isn't the trendiest brand going, but I absolutely LOVE the quality of every pair of Cole Haan shoes I've ever bought and think they are definitely worth the money when I find a style I like. They last forever and are usually very comfortable, all things considered (I am resigned to the fact that a heel will never feel like a sneaker, sadly). These tall caramel boots (which also come in black) are just the kind of sleek classic style that will last for many many years, and the gold detailing on the heel adds a little unique visual interest. These block heel pumps have a similar gold detail in a beautiful ladylike blush color. These and everything else on the site are at least 30% off now through noon on November 28th. Certain items are also 50% off, but most of those are more casual styles. 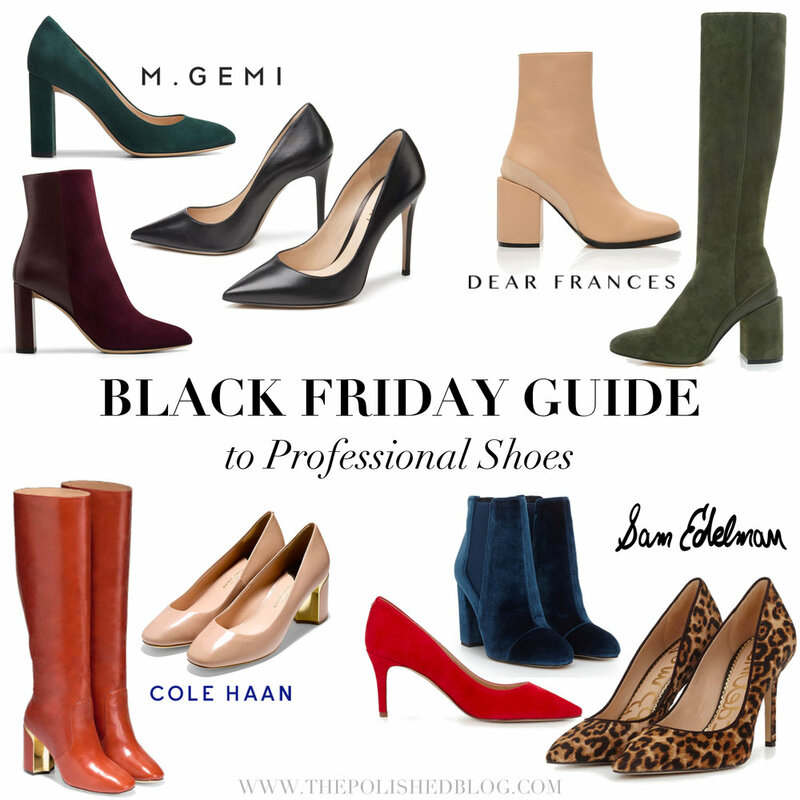 Let me know if you find this post helpful, and I'll try to put another Black Friday guide for workwear (although given the vast universe of Black Friday sales, I will probably need to narrow the scope a bit somehow! ).